Pandora on Tuesday launched a brand campaign dubbed “Sounds Like You” and said it’s making Pandora Premium, previously available by invitation only since March, available to everyone via the App Store, Google Play, or online. Along with the availability of Premium ($9.99 per month), the streaming music service now offers three tiers of service: the ad-supported service (free) and Pandora Plus ($4.99 per month). With Premium, Pandora offers listeners an “Add Similar Songs” feature and personalized music recommendations. The new campaign showcases Pandora’s role in offering personalized music experiences, along with the eclectic musical tastes of the artists featured in digital and outdoor creative, with their influences pictured in the "P" in Pandora’s logo. 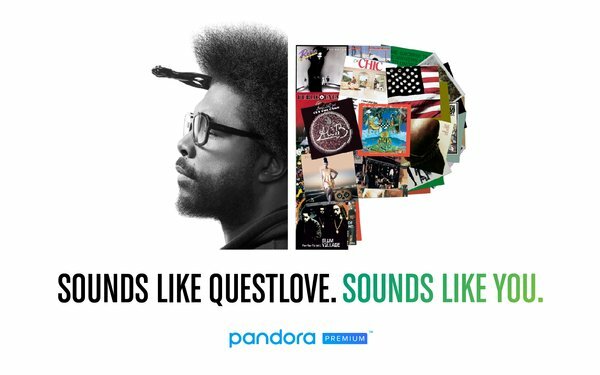 Pandora, which devised the effort with in-house creative and design teams, identified a mix of 18 well-known and up-and-coming artists to feature in the campaign, including Big Sean, Gorillaz, Miranda Lambert, Keith Urban, Ziggy Marley, and Questlove. The U.S.-only campaign consists of mostly mobile, in-app and digital video advertising. It also includes outdoor billboards and murals painted by the artist and designer MADSTEEZ in New York and Los Angeles. Pandora is also partnering with Pitchfork and VICE's music channel Noisey on influencer marketing for the campaign, plans a series of digital video shorts with the artists directed by Academy Award winner Michel Gondry, plus social media activations. There are buys on YouTube, Facebook Live, Instagram, Snapchat filters, and more. Pandora declined to put a price tag on the effort. DigitasLBi, San Francisco handled all production and media strategy (buying and planning). In addition, Pandora will reach listeners through Artist Audio Messages on the service. "This is a transformational moment for Pandora and a moment to re-engage existing and new users, particularly in younger demos across all our ties of service," Nick Bartle, CMO, Pandora, told Real-Time Daily via email. He said the campaign reflect's Pandora’s unique ability "to deliver a music experience completely personal to each listener." As for Pandora now having three tiers of service, Bartle said: "We believe that addressing the entire demand curve and meeting consumers where they are with options, be it ad-supported or subscriptions, is the key to Pandora's long-term growth." Pandora reported full-year 2016 ad revenue of $1.072 billion with 15% year-over-year growth. It will announce Q1 2017 earnings next month.